You can’t buy a gun just like that. Such transactions are guarded by some legal clauses and one of these is that you need to secure a proper bill of sale of a gun from the seller. This bill should comprise of the details of the gun, details of the buyer etc. Thus, the gun dealers usually make use of Bill of Sale for Forms which comprise of the essential segments and subheadings. 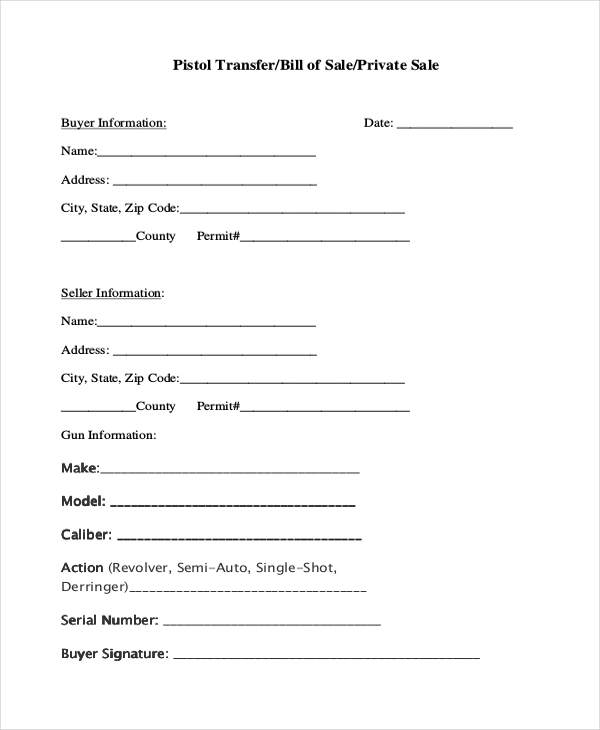 A gun dealer can use this form to design a unique bill document for this showroom. Since this form comprises of the crucial segments to be included in the bill, the user can quickly design a bill and personalize it. You may also see Bill of Sales. Sometimes a gun owner may wish to sell his gun to another person. In such a scenario, he is required to present the buyer with a proper bill in order to legalize the transaction. Using the aforesaid form enables him to design such a document in a jiffy. Usually, when a person buys a gun from a gun dealer or a gun owner, the ownership of the weapon has to be transferred to the buyer. In such circumstances, using the aforesaid gun bill of sale form helps in proving the transfer of the ownership. 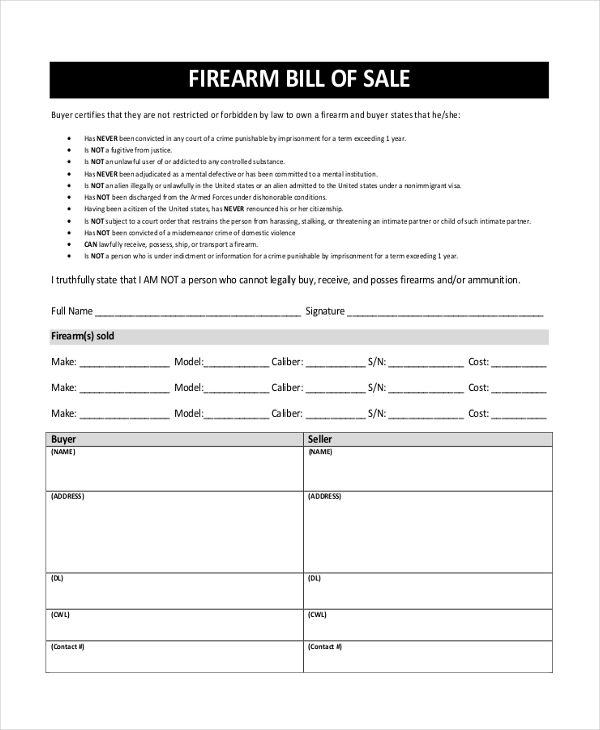 You can also see Gun Bill of Sale Forms. 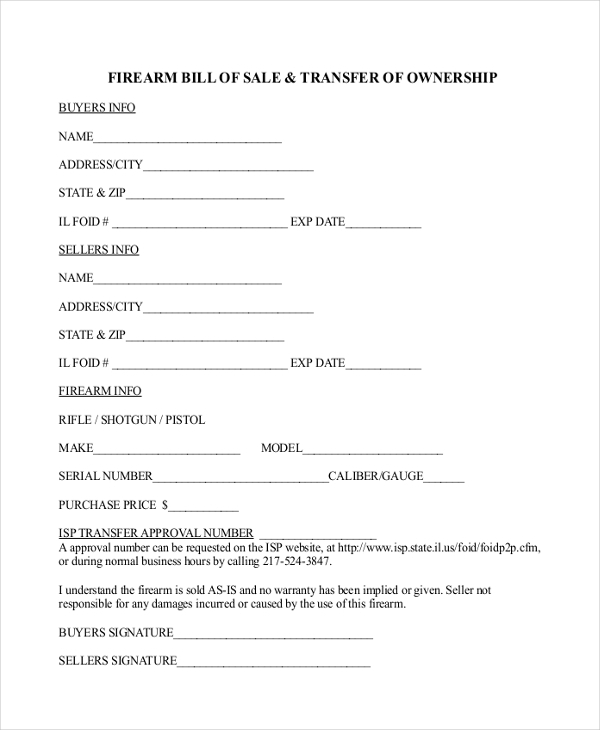 This is a sample of a bill of sale of a gun. This gives the user an idea of the format that he should follow while designing such a document. He also gets to know of the segments and subheadings that he needs to include in the bill. As the name indicates, this bill of sale comes in handy during a buying and selling of a pistol. The bill contains all the subheadings which help in specifying the pistol details as well as the details of the transaction. The user can further personalize and alter the bill as per his needs. 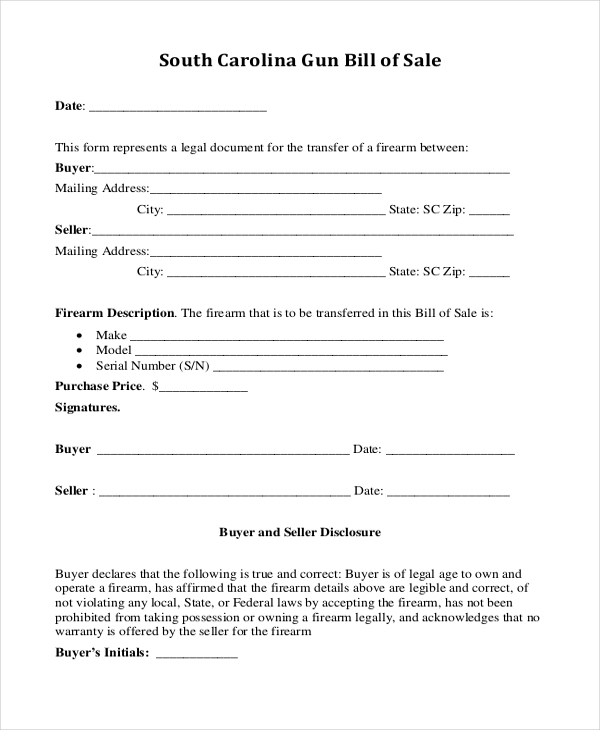 You can also see Firearm Bill of Sale Forms. When a person, sells his gun to a family member within his immediate family, he is required to offer a bill to legalize the transaction and prove the transfer of the ownership of the weapon. Using the aforesaid form simplifies this process as it follows the accepted format. You can also see Generic Bill of Sale Forms. There are some rules that guard the buying and selling of a firearm. 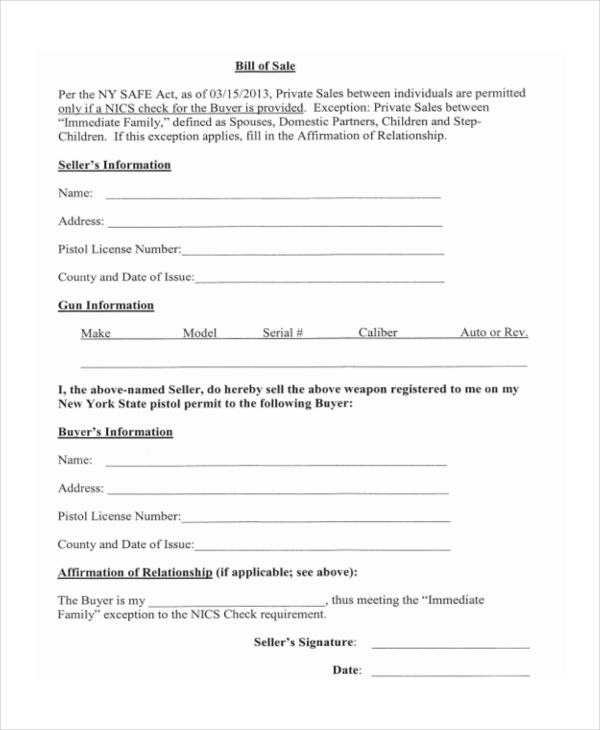 Thus, in order to ensure that these regulations are followed, the buyer and the seller need to present the local police department with an affidavit claiming their awareness of the rules. 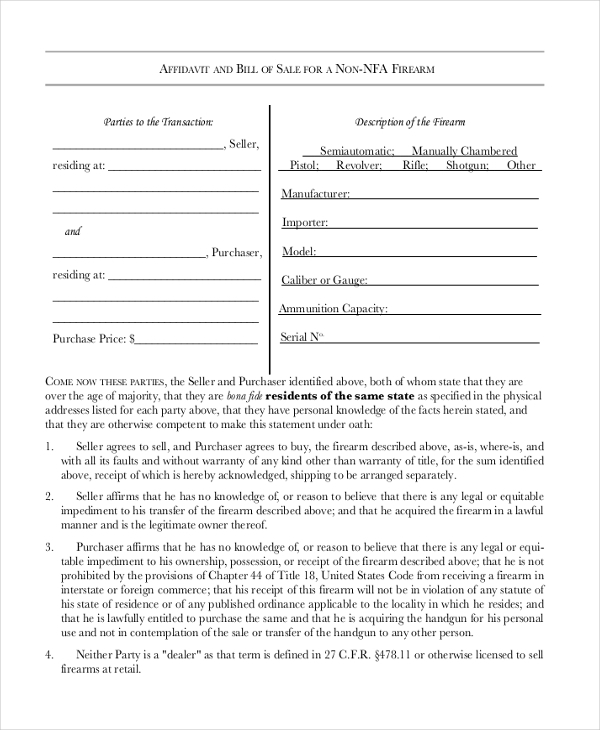 This form helps them draft this affidavit easily. 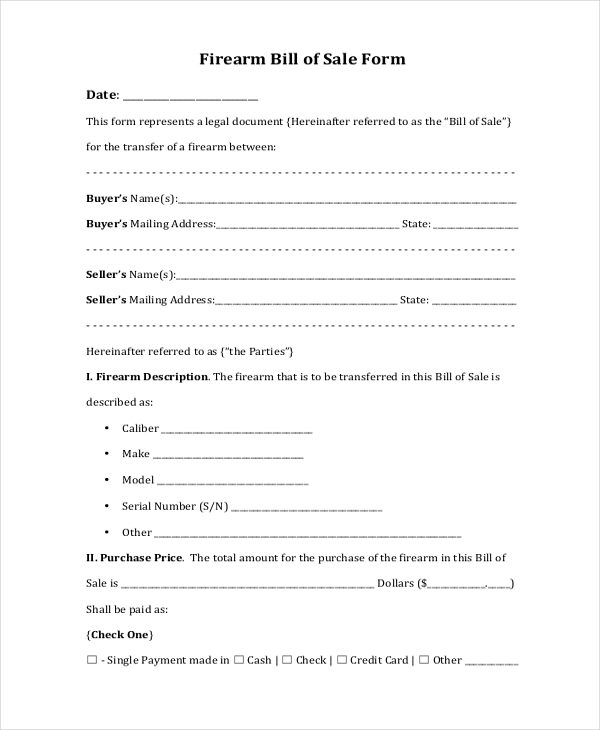 What are the Benefits of Using Bill of Sale Form for Gun? Don’t know how to design a bill of sale for the gun? Don’t worry. Check out our wide range of blank bill of sales forms and find the one that is apt for your requirement. These forms can be easily downloaded and can be quickly customized to come up with a unique design. Available in PDF format, these forms are the best choice for all. You may also see Bill of Sale in PDF.